October 21, 2011. Thousands of CWA and OWS protesters rally at Verizon Wireless store. 20 Verizon workers sleep at Liberty Plaza/Zucotti Park in solidarity with the 99%. Prosecutors instead offered those arrested an adjournment for six months; if the individual is not arrested during that time, the case will be dismissed and sealed. Protestors have threatened to take their cases to trial in an effort to clog up the court system. We’re calling on Mayor Bloomberg to pledge his support for the First Amendment rights of the protesters, and allow them to stay as long as they have a voice to be heard. While the Occupy actions have become national symbols of resistance, the movement has also served to underline the problem of America’s massive police state, which is used to suppress freedom of expression and assembly rather than as an instrument to safeguard those liberties. A day after it was revealed that Cuomo tried — unsuccessfully — to get Albany officials to use police to remove protesters from the park after an 11 p. m. curfew, demonstrators wasted little time in adding the governor to their lineup of concerns. Co-Founder of Occupy the Hood speaks at Occupy Detroit and encourages All Power to the People! This morning at 5am over 500 police in riot gear from cities all over central California brutally attacked the Occupy Oakland encampment at 14th & Broadway. The police attacked the peaceful protest with flash grenades, tear gas, and rubber bullets after moving in with armored vehicles. This outrageous act to silence the voices of the protesters puts Mayor Quan and the City Council on the wrong side of history. Comrades from Cairo: In many ways we in Egypt are part of the same struggle, and we are watching in solidarity. Keep going, don’t stop, occupy more. The Arab Spring and Occupy Wall Street movements show that simply standing together can achieve real results. The Arab Spring, where it sprung up, sought to throw off the yoke of dictatorship within a single country; Occupy Wall Street seeks to disentangle the American dream from a diffuse and all-pervasive system of economic, corporate, and ideological oppression; the Palestinian people seek to liberate themselves from a foreign occupier of their soil. What unites these diverse movements is the struggle for collective liberation. The revolutionary movement in Egypt and its struggle is decisive because unlike many other movements around the world, the working class and its struggle methods are an integral part of this movement. Therefore, all labour and progressive organizations, labour leaders and activists and people seeking a better future for humanity should stand behind the revolutionary movement and the working class in Egypt. Many have alluded to Egypt saying that a growing occupation with one basic demand is how the dictator was overthrown. But in fact, the situation was more complicated than that. In the week before Egypt’s dictator Mubarak was ousted, the working class entered the scene with decisive strike action paralyzing key parts of the economy. Egyptians for Wall streets Chanting “People Demand The Fall of The Regime”, “People demand The Fall of Wall street” 6th of April movement leaders Asmaa Mahfouz, Ahmed Maher and Israa Abd el Fatah leading and supporting the American people in their Wall-street demonstrations in the United States. At OccupyDC, Egypt’s revolutionaries chide U.S.
Police in the Dominican Republic have been responsible for an alarming number of killings and torture over a five-year period, Amnesty International said in a report released Tuesday. I challenge Israelis to treat us as equals. To give us the same social and political benefits they give Jews. To give me, someone who belongs to this land, the same treatment they give someone from Russia or from somewhere else with absolutely no connection to this land. Treat me as an equal, give me what you give yourselves, and I’ll be more than happy to coexist and stop fighting. Give me the right to elect and be elected, and we’ll all give up arms. I challenge them. The report portrays a situation that appears to build on the grim playbook employed in Bahrain, where medical workers faced intimidation and prosecution for treating those injured during antigovernment demonstrations this spring. The unions have supported the camp. The Unite union has donated blankets and bedding, and Len McCluskey, its general secretary, visited last week. And on Wednesday a delegation of the electricians fighting pay cuts came to speak. Yemeni troops loyal to embattled President Ali Abdullah Saleh opened fire Tuesday at thousands of protesters calling for his ouster in the capital Sanaa, killing two, a medical official said. If this thing continues to grow — and there is every indication that it will — the Occupy Wall Street could become the definitive movement for an entire generation. PROTESTS AGAINST union-busting and police brutality in New York City last week — while smaller than the biggest mobilizations recently — show that the Occupy Wall Street (OWS) movement is continuing to grow and relate to the struggles of working-class New Yorkers. Comparing debt to slavery, believing police won’t hurt you, or wanting to take back the America you see as rightfully yours are things that suggest OWS is actually appealing to an imagined white (re)public. Rather than trying to figure out how to diversify the Occupy Wall Street movement, white progressives need to think long and hard about their use of frameworks and rhetoric that situate blacks at the margins of the movement. Democracy, particularly in a diverse community or society, should not necessarily be about achieving unity on all issues. There must be room for disagreement and multiple perspectives. What is important is that all concerns and interests have an equal opportunity to be heard and evaluated. One issue that Occupy Portland is currently facing in its decision-making practice is the lack of time available to individuals to voice their ideas. This is inherent in the use of the “People’s Mic” technique, which nicely addresses the lack of amplification and creates a certain experience of unity through its mechanism, yet privileges those who are more comfortable speaking in front of crowds, as well as those with louder or more assertive voices. While President Obama and some Republican candidates struggle with how to embrace the pain and anger fueling the Occupy Wall Street movement – while not endorsing the politically polarizing street protests – the Oval Office seekers have not been shy about accepting money from the financial world. Whatever shape the relationship between the US and Iraq takes in the long term, for the short term the US is definitely remaining in the country. 6:00 p.m., DC 37, 125 Barclay Street, Rm. 11. In solidarity with the people of Palestine, we are asking that on Oct. 28th everyone come to Liberty Plaza wearing their Kuffeya. EIR will be on site silk screening shirts for a $2 donation. A call to Blacks, Latinos, and immigrants to occupy their communities against predatory investors, displacement, privatization and state repression. Let us assert our Dignity! WE MUST DEFEND OUR COMMUNITIES! THIS IS OUR STRUGGLE, THIS IS OUR MOMENT IN HISTORY. THIS IS PEOPLE’S POWER! 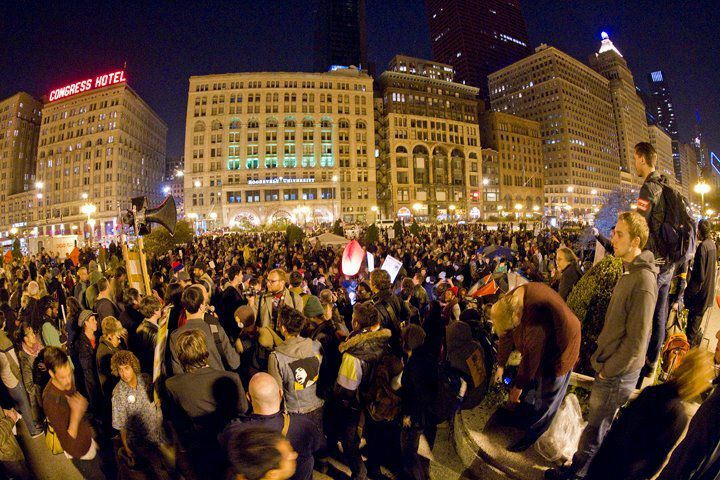 Welcome to OCCUPY TOGETHER, an unofficial hub for all of the events springing up across the country in solidarity with Occupy Wall St.
Brought to you by the people who occupy wall street. Why will YOU occupy? PLEASE CIRCULATE WIDELY: If you are arrested at an Occupy Event, call the National Lawyers Guild: New York City: (212) 679-6018 Los Angeles: (323) 696-2299 Washington, DC: (202) 957 2445 Chicago: (773) 309-1198 San Francisco: (415) 285-1011 New Orleans: (504) 875-0019 Baltimore: (410) 205-2850 Minnesota: (612) 656-9108 Michigan: (313) 963-0843 Portland: (503) 902-5340 Boston: (617) 227-7335 Pennsylvania & Delaware: (267) 702-4654 Idaho: (208) 991-4324 Be very sure to write the applicable phone number in PERMANENT marker somewhere concealed on your body, protected from the elements. Do NOT assume you will be able to retrieve the number from a phone or a notebook. It is very likely you will be stripped of all your belongings. The resistance continues at Liberty Square and Nationwide! Created in response to the lack of racial diversity at #OccupyWallStreet with the purpose of developing critical consciousness within the movement and extending its reach to include those most affected by the current crisis. It is open to all who identify as people of color.